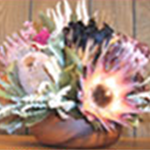 Our preserved Maui Protea is dried by a special process to retain its shape and soft muted colors. 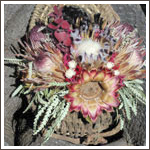 Dried Maui Protea floral art is durable and will look beautiful for years to come. 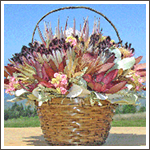 All of our dried arrangements can also be made in any of the baskets you see on the Fresh Protea Baskets page. 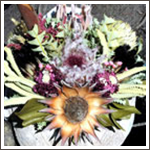 Every piece is individually made and no two pieces are exactly alike. Please call with any questions or custom design requests. 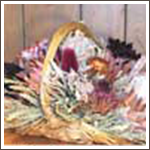 This round rattan stained basket with a handle is filled with dried protea and accents. 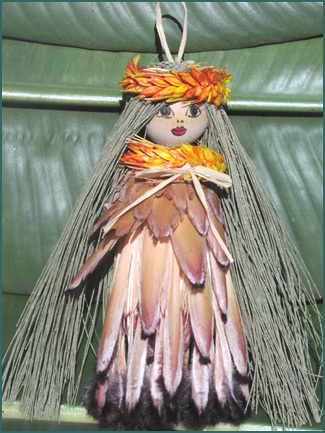 Approximately 13" in diameter and height. - US priority mail shipping. 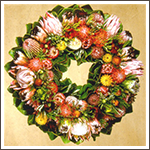 A 24" diameter wreath of fresh Maui Protea - FedEx shipping that will take your breath away! 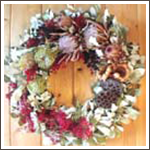 From brilliantly colored to soft muted tones as it dries, this wreath can be enjoyed forever.